The researchers were looking for young adult identical twins in their early- to mid-20s whose exercise habits had substantially diverged after they had left their childhood homes. These twins were not easy to find. Most of the pairs had maintained remarkably similar exercise routines, despite living apart. But eventually the researchers homed in on 10 pairs of male identical twins, one of whom regularly exercised, while the other did not, usually because of work or family pressures, the researchers determined. The dissimilarities in their exercise routines had mostly begun within the past three years, according to their questionnaires. The scientists invited these twins into the lab and measured each young man’s endurance capacity, body composition and insulin sensitivity, to determine their fitness and metabolic health. The scientists also scanned each twin’s brain. Then they compared the twins’ results. The twins’ brains also were unalike. The active twins had significantly more grey matter than the sedentary twins, especially in areas of the brain involved in motor control and coordination. Presumably, all of these differences in the young men’s bodies and brains had developed during their few, brief years of divergent workouts, underscoring how rapidly and robustly exercising — or not — can affect health, said Dr. Urho Kujala, a professor of sports and exercise medicine at the University of Jyvaskyla who oversaw the study. 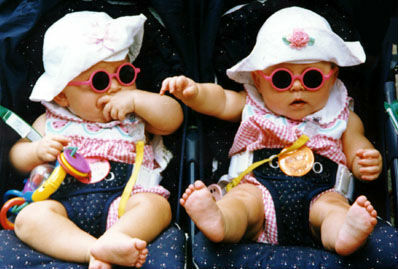 Of course, the study was small and not a formal randomized trial, although it involved identical twins. But Dr. Kujala said he believes that the results strongly imply that the differences in the twin’s exercise habits caused the differences in their bodies. More subtly, the findings also point out that genetics and environment “do not have to be” destiny when it comes to exercise habits, Dr. Kujala said. For these particular twins, whether their genes and childhoods nudged them toward exercising regularly or slumping on the couch, one of the pair overcame that legacy and did the opposite (for better and worse). The rest of us can do likewise, Dr. Kujala said. Even if the input from our DNA and upbringing urges us to skip the gym, we can “move more,” he said, and, based on this study, rapidly and substantially improve the condition of our bodies and brains. via One Twin Exercises, the Other Doesn’t – NYTimes.com. Who Is More Anti-Science? Republicans? Or Democrats?